Motto: "Fa'avae i le Atua Sāmoa"
Samoa (; Samoan: Sāmoa, IPA: ), officially the Independent State of Samoa (Samoan: Malo Sa'oloto Tuto'atasi o Sāmoa), formerly known as Western Samoa, is an Oceanian country encompassing the western part of the Samoan Islands in the South Pacific Ocean. It became independent from New Zealand in 1962. The two main islands of Samoa are Upolu and Savai'i, one of the biggest islands in Polynesia. The capital city, Apia, and Faleolo International Airport are situated on the island of Upolu. Samoa was admitted to the United Nations on 15 December 1976. The entire island group, inclusive of American Samoa, was called "Navigator Islands" by European explorers before the 20th century because of the Samoans' seafaring skills. The origins of the Samoans are closely studied in modern research about Polynesia in various scientific disciplines such as genetics, linguistics and anthropology. Scientific research is ongoing although a number of different theories exist; including one proposing that the Samoans originated from Austronesian predecessors during the terminal eastward Lapita expansion period from Southeast Asia and Melanesia between 2,500 and 1,500 BCE. The Samoan origins are currently being reassessed due to new scientific evidence and carbon dating findings from 2003 and onwards. Intimate sociocultural and genetic ties were maintained between the eastern Lapita colonies and the archaeological record supports oral tradition and native genealogies that indicate inter-island voyaging and intermarriage between prehistoric Samoans, Fijians, and Tongans. Contact with Europeans began in the early 18th century. Jacob Roggeveen (1659–1729), a Dutchman, was the first known European to sight the Samoan islands in 1722. This visit was followed by French explorer Louis-Antoine de Bougainville (1729–1811), who named them the Navigator Islands in 1768. Contact was limited before the 1830s which is when English missionaries and traders began arriving. 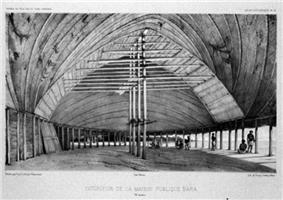 Mission work in Samoa had begun in late 1830 by John Williams, of the London Missionary Society arriving in Sapapali'i from The Cook Islands and Tahiti. According to Barbara A. West, "The Samoans were also known to engage in 'headhunting,' a ritual of war in which a warrior took the head of his slain opponent to give to his leader, thus proving his bravery." There is recorded history of an event which took place when two German lives were taken and then their corpses beheaded by a citizen during that nation's administration of Samoa. A return attempt between two Samoans led to similar beheading although the practice was known not to be condoned amongst Samoans. The event precedes the short time before further tripartite conflict for the territories. Robert Louis Stevenson, the author, who lived in Samoa from 1889 wrote in his record of the period 1882–1892 A Footnote to History: Eight Years of Trouble in Samoa, "The Samoans are gentle people." 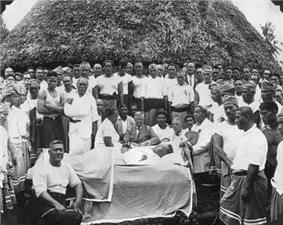 The Germans in particular began to show great commercial interest in the Samoan Islands, especially on the island of 'Upolu where German firms monopolised copra and cocoa bean processing; the United States laid its own claim and formed alliances with local native chieftains, most conspicuously on the islands of Tutuila and Manu'a. Britain also sent troops to protect British business enterprise, harbour rights, and consulate office. There followed an eight-year civil war, where each of the three powers supplied arms, training, and in some cases, combat troops to the warring Samoan parties. The Samoan crisis came to a critical juncture in March 1889 when all three colonial contenders sent warships into Apia harbour, and a larger-scale war seemed imminent, until a massive storm on 15 March 1889 damaged or destroyed the warships, ending the military conflict. The Second Samoan Civil War was a conflict that reached a head in 1898 when Germany, the United Kingdom, and the United States were locked in dispute over who should have control over the Samoa Islands. The Siege of Apia occurred during the Second Samoan Civil War in March 1899 at Apia. Samoan forces loyal to Prince Tanu were besieged by a larger force of Samoan rebels loyal to Mata'afa Iosefo. Supporting Prince Tanu were landing parties from four British and American warships. Over the course of several days of fighting, the Samoan rebels were defeated. American and British warships shelled Apia on 15 March 1899; including the USS Philadelphia. Germany, the United Kingdom and the United States quickly resolved to end the hostilities and partitioned the island chain at the Tripartite Convention of 1899, signed at Washington on 2 December 1899 with ratifications exchanged on 16 February 1900. The eastern island-group became a territory of the United States (the Tutuila Islands in 1900 and officially Manu'a in 1904) and became known as American Samoa; the western islands, by far the greater landmass, became known as German Samoa. The United Kingdom had vacated all claims in Samoa and was compensated with (1) termination of German rights in Tonga, (2) all of the Solomon Islands south of Bougainville, and (3) territorial alignments in West Africa. The German Empire governed the western Samoan islands from 1900 to 1914. “Over all, the period of German rule was the most progressive, economically, that the country has experienced.” Wilhelm Solf was appointed the colony’s first governor. His actions and conduct became “… paternal, fair and absolute.” However, when in 1908 the non-violent Mau a Pule resistance movement arose, Solf did not hesitate to banish the Mau leader Lauaki Namulauulu Mamoe to Saipan in the German Northern Mariana Islands. Po’o aiga ma a latou tama". This first recognised the authority and identity of principal districts of Samoa through their spokesmen – Tumua ma Pule, Itu’au ma Alataua, Aiga-i-le-Tai, and the Va'a-o-Fonoti – and the highest titles which were bestowed by these groups. It concludes with the recognition of the great maximal descent groups of Samoa and their "sons" who had been chosen to hold the highest titles. "Tulouna a lana Maiesitete le Kaisa o le tupu mamalu o lo tatou malo kasialika aoao. Tulouna a lana afioga le kovana kasialika o le sui o le kaisa I Samoa nei. Ua fa’amanatuiana ai aiga e lua I o oulua tofiga Kasialika o le Fautua. Tulouna a le vasega a Faipule Kasialika o e lagolago malosi I le Malo. Afifio mai le nofo a vasega o tofiga Kasialika o e usu fita I le tautua I le malo". In the beginning month of the Great War, on 29 August 1914, troops of the New Zealand Expeditionary Force landed unopposed on 'Upolu and seized control from the German authorities, following a request by Great Britain for New Zealand to perform their "great and urgent imperial service." From the end of World War I until 1962, New Zealand controlled Samoa as a Class C Mandate under trusteeship through the League of Nations, then through the United Nations. There followed a series of New Zealand administrators who were responsible for two major incidents. In the first incident, approximately one fifth of the Samoan population died in the influenza epidemic of 1918–1919. In 1919 The Royal Commission of Inquiry into the Epidemic concluded that there had been no epidemic of pneumonic influenza in Western Samoa before the arrival of the SS Talune from Auckland on 7 November 1918. The NZ administration allowed the ship to berth in breach of quarantine; within seven days of this ship's arrival influenza became epidemic in Upolu and then spread rapidly throughout the rest of the territory. By 1918, Samoa had population of some 38,000 Samoans and 1,500 Europeans. Schnee, Dr. Heinrich (former Deputy Governor of George Allen & Unwin. Stevenson, Robert Louis. A Footnote to History: Eight Years of Trouble in Samoa. BiblioBazaar. Urmenyhazi Attila. 2013 book publication "Samoan & Marquesan Life in Oceania: a probing travelogue". ISBN 9780646909127 – National Library of Australia, Bib ID: 6377055. ^ a b c d "CIA – The World Factbook". cia.gov. 2012. Retrieved 9 August 2012. ^ New Zealand Ministry for Culture and Heritage (19 July 2010). "Towards independence – NZ in Samoa". nzhistory.net.nz. Retrieved 29 April 2011. ^ a b c d "Samoa". International Monetary Fund. Retrieved 20 April 2012. ^ "Samoa – The Heart of Polynesia". Polynesian Culture Center. ^ Green, Roger C.; Leach, Helen M. (1989). "New Information for the Ferry Berth Site, Mulifanua, Western Samoa". Journal of the Polynesian Society 98 (3): 319–330. Retrieved 30 January 2011. ^ Stevenson, Robert Louis (1892). ^ Hermann Hiery, "West Samoans between Germany and New Zealand 1914–1921," War and Society (1992) 10#1 pp 53–80. ^ Laracy, Hugh. 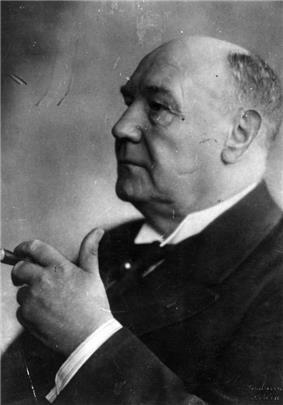 "Nelson, Olaf Frederick 1883 – 1944". ^ "The Mau Movement" (PDF). Archived from the original on 1 December 2007. Retrieved 27 November 2007. ^ Field, Michael (2006). Black Saturday: New Zealand's tragic blunders in Samoa. Auckland, N.Z. : Reed Publishing (NZ). ^ "Constitution Amendment Act (No 2) 1997". ^ Theroux, Paul (1992). The Happy Isles of Oceania: Paddling the Pacific. New York, NY: G.P. Putnam's Sons (NZ). ^ "Samoa to go Back to the Future, shifting date line". Miami Herald. 9 May 2011. Retrieved 9 May 2011. ^ "New head of state for Samoa". The New Zealand Herald (Auckland). 16 June 2007. Retrieved 16 June 2007. 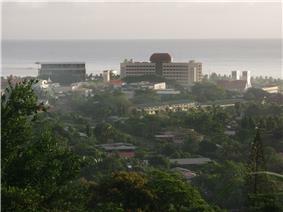 ^ "Samoa an Overview". donbosco.asn.au. Archived from the original on 20 November 2007. ^ Koppers, Anthony A.P. ; Russell, Jackson, Konter, Staudigel, and Hart (June 2008). "Samoa reinstated as a primary hotspot trail". ^ "Samoa moves into tomorrow". ^ "Samoans set to time travel". ^ "Smaoa: Climate". Encyclopædia Britannica. Retrieved 26 November 2007. ^ "Worn With Pride – Tatau (Tatoo)". Oceanside Museum of Art. Retrieved 26 November 2007. ^ "NZ Feature Project: Flying Fox in a Freedom Tree – The New Zealand Film Archive". Filmarchive.org.nz. Retrieved 30 June 2010. ^ "NZ Feature Project: Sons For the Return Home – The New Zealand Film Archive". Filmarchive.org.nz. Retrieved 30 June 2010. ^ "Lemi Ponifasio / MAU". ^ "Buy NZ books and NZ plays online – Home". Playmarket. Retrieved 30 June 2010. American football is occasionally played in Samoa, reflecting its wide popularity in American Samoa, where the sport is played under high school sanction. About 30 ethnic Samoans, many from American Samoa, currently play in the National Football League. A 2002 article from ESPN estimated that a Samoan male (either an American Samoan, or a Samoan living in the mainland United States) is 40 times more likely to play in the NFL than a non-Samoan American. Samoans have been very visible in boxing, kickboxing, wrestling, and sumo; some Samoan sumo wrestlers, most famously Musashimaru and Konishiki have reached the highest rank of Ozeki and yokozuna. Rugby league is mostly played by Samoans living in New Zealand and Australia, with Samoa reaching the quarter finals of the 2013 Rugby League World Cup made of players playing in the NRL, Super League and domestic players. Many Samoans and New Zealanders or Australians of Samoan descent play in the Super League and National Leagues in Britain. Francis Meli, Ta'ane Lavulavu of Workington Town, Maurie Fa'asavalu of St Helens and David Fatialofa of Whitehaven and Setima Sa who signed with London Irish rugby club. Other noteworthy players from NZ and Australia have represented the Samoan National team. The 2011 domestic Samoan rugby league competition contained 10 teams with plans to expand to 12 in 2012. Prominent Samoan players include Pat Lam and Brian Lima. In addition many Samoans have played for or are playing for New Zealand. At club level there is the National Provincial Championship and Pacific Rugby Cup. They also took home the cup at Wellington and the Hong Kong Rugby Sevens in 2007—for which the Prime Minister of Samoa, also Chairman of the national rugby union, Tuila’epa Sa’ilele Malielegaoi, declared a national holiday. They also were the IRB World Sevens Series Champions in 2010 capping a year of achievement for the Samoans, following wins in the USA, Australia, Hong Kong and Scotland Sevens tournaments. Rugby union is the national sport in Samoa and the national team, nicknamed the Manu Samoa, is consistently competitive against teams from vastly more populous nations. Samoa has competed at every Rugby World Cup since 1991, and made the quarter finals in 1991, 1995 and the second round of the 1999 world cup. 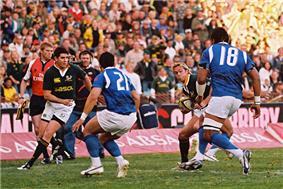 At the 2003 world cup, Manu Samoa came close to beating eventual world champions, England. Samoa also played in the Pacific Nations Cup and the Pacific Tri-Nations The sport is governed by the Samoa Rugby Football Union, who are members of the Pacific Islands Rugby Alliance, and thus, also contribute to the international Pacific Islanders rugby union team. The main sports played in Samoa are rugby union, rugby league, Samoan cricket and netball. Rugby union is the national football code of Samoa. In Samoan villages, volleyball is also popular. Actor and director Nathaniel Lees has featured in many theatre productions and films including his role as Captain Mifune in The Matrix movie trilogy. Published playwrights include Oscar Kightley, Victor Rodger, Makerita Urale and Niuean Samoan playwright Dianna Fuemana. In comedy, Laughing Samoans, the Naked Samoans and Kila Kokonut Krew have enjoyed sold-out tours. The arts organisation Tautai is a collective of visual artists including Fatu Feu'u, Johnny Penisula, Shigeyuki Kihara, Iosefa Leo, Michel Tuffery, John Ioane and Lily Laita. Lemi Ponifasio is a director and choreographer who is prominent internationally with his dance Company MAU. Neil Ieremia's company Black Grace has also received international acclaim with tours to Europe and New York. Hip hop has had a significant impact on Samoan culture. According to Katerina Martina Teaiwa, PhD from the University of Hawaii at Manoa, "Hip hop culture in particular is popular amongst Samoan youth." This is not surprising considering the large amounts of migration between Samoa, Hawaii, and the United States mainland, specifically California. In addition, the integration of hip hop elements into Samoan tradition also "testifies to the transferability of the dance forms themselves," and to the "circuits through which people and all their embodied knowledge travel." Dance both in its traditional form and its more modern forms has remained a central cultural currency to Samoans, especially youths. Albert Wendt is a significant Samoan writer whose novels and stories tell the Samoan experience. In 1989, his novel Flying Fox in a Freedom Tree was made into a feature film in New Zealand, directed by Martyn Sanderson. Another novel Sons for the Return Home had also been made into a feature film in 1979, directed by Paul Maunder. The late John Kneubuhl, born in American Samoa, was an accomplished playwright and screenwriter and writer. Sia Figiel won the 1997 Commonwealth Writers' Prize for fiction in the south-east Asia/South Pacific region with her novel "Where We Once Belonged". Momoe Von Reiche is an internationally recognised poet and artist. Tusiata Avia is a performance poet. Her first book of poetry Wild Dogs Under My Skirt was published by Victoria University Press in 2004. Dan Taulapapa McMullin is an artist and writer. Other Samoan poets and writers include Sapa'u Ruperake Petaia, Eti Sa'aga and Savea Sano Malifa, the editor of the Samoa Observer. 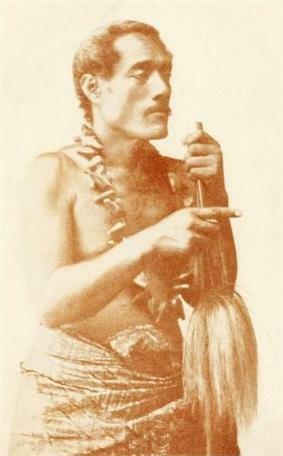 The Samoan word for dance is siva with unique gentle movements of the body in time to music and which tells a story, although the Samoan male dances can be more physical and snappy. The sasa is also a traditional dance where rows of dancers perform rapid synchronised movements in time to the rhythm of wooden drums (pate) or rolled mats. Another dance performed by males is called the fa'ataupati or the slap dance, creating rhythmic sounds by slapping different parts of the body. This is believed to have been derived from slapping insects on the body. Some Samoans are spiritual and religious, and have subtly adapted the dominant religion of Christianity to 'fit in' with fa'a Samoa and vice versa. As such, ancient beliefs continue to co-exist side-by-side with Christianity, particularly in regard to the traditional customs and rituals of fa'a Samoa. 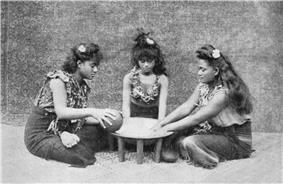 The Samoan culture is centred around the principle of vāfealoa'i, the relationships between people. These relationships are based on respect, or fa'aaloalo. When Christianity was introduced in Samoa, most Samoan people converted. Currently 98% of the population identify themselves as Christian. Samoan and English are official languages. Samoan Sign Language is used by at least some of the deaf population. Samoans' religious adherence includes the following: Christian Congregational Church of Samoa 31.8%, Roman Catholic 19.4%, Methodist 15.2%, Assembly of God 13.7%, Mormon 7.6%, Seventh-day Adventist 3.9%, Worship Centre 1.7%, other Christian 5.5%, other 0.7%, none 0.1%, unspecified 0.1% (2011 estimate). 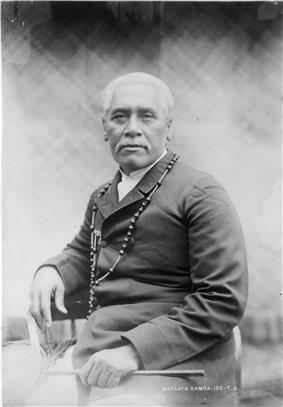 The Head of State until 2007, His Highness Malietoa Tanumafili II, was a Bahá'í convert. Samoa hosts one of seven Bahá'í Houses of Worship in the world; completed in 1984 and dedicated by the Head of State, it is located in Tiapapata, 8 km (5 mi) from Apia. Samoa has a population of 194,320 of which 92.6% are Samoans, 7% Euronesians (people of mixed, European and Polynesian ancestors) and 0.4% are Europeans, per the CIA World Factbook. About three-quarters of the population live on the main island of Upolu. Only the Māori of New Zealand outnumber Samoans among Polynesian groups. 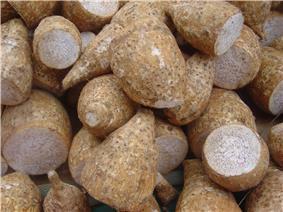 In the period before German colonisation, Samoa produced mostly copra. German merchants and settlers were active in introducing large scale plantation operations and developing new industries, notably cocoa bean and rubber, relying on imported labourers from China and Melanesia. When the value of natural rubber fell drastically, about the end of the Great War (World War I), the New Zealand government encouraged the production of bananas, for which there is a large market in New Zealand. Outside of a large automotive wire harness factory (Yazaki Corporation), the manufacturing sector mainly processes agricultural products. Tourism is an expanding sector which now accounts for 25% of GDP. Tourist arrivals have been increasing over the years with more than 100,000 tourists visiting the islands in 2005, up from 70,000 in 1996. The country currency is the Samoan tālā, issued and regulated by the Central Bank of Samoa. The economy of Samoa has traditionally been dependent on agriculture and fishing at the local level. In modern times, development aid, private family remittances from overseas, and agricultural exports have become key factors in the nation's economy. Agriculture employs two-thirds of the labour force, and furnishes 90% of exports, featuring coconut cream, coconut oil, noni (juice of the nonu fruit, as it is known in Samoan), and copra. Gross Domestic Product (GDP) in purchasing power parity (PPP) in 2006 was estimated at $1.218 billion USD. The industrial sector is the largest component of GDP at 58.4%, followed by the services sector at 30.2% (2004 est.). Agriculture represents only 11.4% of GDP (2004 est.). Samoan labour force is estimated at 90,000. View above the Falealupo Rainforest canopy walkway, Savaii. 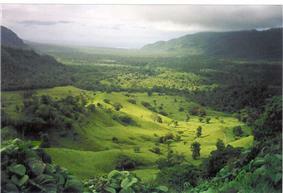 Samoa is located within the Samoan tropical moist forests ecoregion. Since human habitation began, about 80% of the lowland rain forests has been lost. Within the ecoregion about 28% of plants and 84% of land birds are endemic. The climate is equatorial/monsoonal, with an average annual temperature of 26.5 °C (79.7 °F), and a rainy season from November to April. Savai'i is the largest of the Samoan islands and the sixth largest Polynesian island after New Zealand's North, South and Stewart Islands and the Hawaiian islands of Hawaiʻi and Maui. The population of Savai'i is 42,000 people. Samoa was previously located east of the international date line but in 2011, Samoan Prime Minister Tuilaepa Sailele announced his country would move the International Date Line to the east of the country, so that Samoa would lie to the west of the date line. This change took effect on the night of 29 December, so that the Friday was skipped altogether and the following day was Saturday 31 December. The Samoan islands have been produced by vulcanism, the source of which is the Samoa hotspot which is probably the result of a mantle plume. While all of the islands have volcanic origins, only Savai'i, the western most island in Samoa, is volcanically active with the most recent eruptions in Mt Matavanu (1905–1911), Mata o le Afi (1902) and Mauga Afi (1725). The highest point in Samoa is Mt Silisili, at 1858 m (6,096 ft). The Saleaula lava fields situated on the central north coast of Savai'i are the result of the Mt Matavanu eruptions which left 50 km² (20 sq mi) of solidified lava. These are the three islets in the Apolima Strait (Manono Island, Apolima and Nu'ulopa), the four Aleipata Islands off the eastern end of Upolu (Nu'utele, Nu'ulua, Namua, and Fanuatapu), and Nu'usafe'e (less than 0.01 km² – 2½ acres – in area and about 1.4 km (0.9 mi) off the south coast of Upolu at the village of Vaovai). The main island of Upolu is home to nearly three-quarters of Samoa's population, and its capital city is Apia. Samoa is located south of the equator, about halfway between Hawaii and New Zealand in the Polynesian region of the Pacific Ocean. The total land area is 2,842 km² (1,097 sq mi), consisting of the two large islands of Upolu and Savai'i which account for 99% of the total land area, and eight small islets. The capital village of each district administers and coordinates the affairs of the district and confers each districts' paramount title, amongst other responsibilities. For example, the District of A'ana has its capital at Leulumoega. The paramount title of A'ana is the TuiA'ana. The orator group which confers this title – the Faleiva (House of Nine) – is based at Leulumoega. This is also the same for the other districts. In the district of Tuamasaga, the paramount title of the district – The Malietoa title – is conferred by the FaleTuamasaga based in Afega. Prominent women in Samoan politics include the late Laulu Fetauimalemau Mata'afa (1928–2007) from Lotofaga constituency, the wife of Samoa's first prime minister. Their daughter Fiame Naomi Mata'afa is a paramount chief and a long-serving senior member of cabinet. Other women in politics include Samoan scholar and eminent professor Aiono Fanaafi Le Tagaloa, orator-chief Matatumua Maimoana and Safuneitu'uga Pa'aga Neri, the current Minister of Communication and Technology. The unicameral legislature (Fono) consists of 49 members serving 5-year terms. Forty-seven are matai title holders elected from territorial districts by Samoans; the other two are chosen by non-Samoans with no chiefly affiliation on separate electoral rolls. Universal suffrage was extended in 1990, but only chiefs (matai) may stand for election to the Samoan seats. There are more than 25,000 matais in the country, about 5% of whom are women. The prime minister is chosen by a majority in the Fono and is appointed by the head of state to form a government. The prime minister's choices for the 12 cabinet positions are appointed by the head of state, subject to the continuing confidence of the Fono. The 1960 constitution, which formally came into force with independence from New Zealand in 1962, is based on the British pattern of parliamentary democracy, modified to take account of Samoan customs. The national modern Government of Samoa is referred to as the 'Malo'. Samoa's first Prime Minister was Fiame Mata'afa Faumuina Mulinu’u II, one of the four highest-ranking paramount chiefs in the country. Two other paramount chiefs at the time of independence were appointed joint heads of state for life. Tupua Tamasese Mea'ole died in 1963, leaving Malietoa Tanumafili II sole head of state until his death on 11 May 2007, upon which Samoa changed from a constitutional monarchy to a parliamentary republic de facto. The next Head of State, Tuiatua Tupua Tamasese Efi, was elected by the legislature on 17 June 2007 for a fixed five-year term. At the end of December 2011, Samoa jumped forward by one day, omitting 30 December from the local calendar, when the nation moved to the west of the International Date Line. This change aimed to help the nation boost its economy in doing business with Australia and New Zealand. Before this change, Samoa was 21 hours behind Sydney, but the change means it is now three hours ahead. The previous timezone, agreed on 4 July 1892, operated in line with American traders based in California. On 7 September 2009 the government changed the driving orientation for motorists: Samoans now drive on the left hand side of the road. This brought Samoa into line with many other countries in the region. Samoa thus became the first country in recent years - and the first in the 21st century - to switch to driving on the left. In July 1997 the government amended the constitution to change the country's name from Western Samoa to Samoa. The US territory of American Samoa protested the move, asserting that the change diminished its own identity. As of 2012 American Samoans still use the terms Western Samoa and Western Samoans to describe the independent State of Samoa and its inhabitants. Travel writer Paul Theroux noted marked differences between the societies in Samoa and American Samoa. In 2002, New Zealand's prime minister Helen Clark, on a trip to Samoa, formally apologised for New Zealand's role in the events of 1918 and 1929. After repeated efforts by the Samoan independence movement, Western Samoa gained independence on 1 January 1962 and signed a friendship treaty with New Zealand. Samoa, the first small-island country in the Pacific to become independent, joined the Commonwealth of Nations on 28 August 1970. While independence was achieved at the beginning of January, Samoa annually celebrates 1 June as its independence day. The New Zealand police attempted to arrest one of the leaders in the demonstration. When he resisted, a struggle developed between the police and the Mau. The officers began to fire randomly into the crowd and a Lewis machine gun, mounted in preparation for this demonstration, was used to disperse the demonstrators. Chief Tamasese was shot from behind and killed while trying to bring calm and order to the Mau demonstrators, screaming "Peace, Samoa". Ten others died that day and approximately 50 were injured by gunshot wounds and police batons. That day would come to be known in Samoa as Black Saturday. The Mau grew, remaining steadfastly non-violent, and expanded to include a highly influential women's branch.